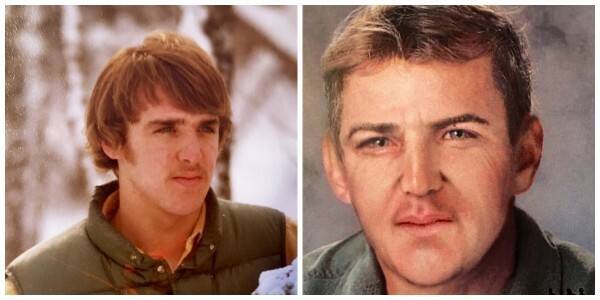 Bernard "Bunny" Ross, Jr., as he appeared when he went missing in Aroostook County at the age of 18 in 1977, left, and a computer-generated image of what he might look like today. PORTLAND, Maine — An anonymous letter-writer claims to know what happened to Bernard “Bunny” Ross Jr., who went missing at the age of 18 in Aroostook County nearly 40 years ago, police said Friday. Lt. Troy Gardner of the Maine State Police told reporters in Portland, where Ross’ parents now live, that investigators want the author to come forward and talk to police. Gardner said Ross’ parents, who lived in Fort Kent at the time of his disappearance, received the letter “a few months ago,” but would not disclose any other details about it, including whether it was handwritten or typed, how many pages it was, where it was postmarked or what the writer claimed happened to the missing man. Gardner said police are reluctant to release more information about the letter without learning more about the author and, if the information in the letter is reliable, how that person knows it. Ross went missing on May 12, 1977. That morning, he took a family car from their home in Fort Kent to his aunt’s house in Presque Isle. Then, Gardner said Friday, he took another vehicle without permission in Presque Isle. That vehicle was later found in Ashland more than 20 miles away, and Ross was last seen on the Realty Road near the Ashland-Portage town line. “I think the community was shocked,” said his father, Bernard Ross Sr., 80, on Friday morning. Carol and Bernard Ross Sr. moved to southern Maine in 1981 and lived in Gorham until 2001, when they moved to Portland. Carol Ross said Friday that Bunny Ross, one of six children, was “going through some ups and downs” emotionally at the time of his disappearance, but Gardner and the man’s parents on Friday characterized his state of mind as not abnormal for someone in his teenage years. Gardner said he hopes the person who wrote the anonymous letter — or anyone else with information about what happened to Ross — calls state police at 1-800-924-2261 or 532-5400 and asks to speak with Sgt. Darrin Crane. The Maine State Police also has an online tip form that can be accessed through their website.